Last week we received an incredible gift from Bruce (otherwise known as Daily Wood) and Christine and their two fur-kids, Maximus and Titan. We've never met them. One of these days, we will. It's imperative. These two humans have a heart of gold and since almost the beginning of our adventures with Bodacious Biscuit Love, we've formed a bond with this family. It began in early 2014. Their two fur-kids are Great Danes who have a picky palate when it comes to treats. And, they have a bit of a sweet tooth. Bruce and Christine ordered biscuits. Could we make them larger to accommodate their large size? Yes. Lots of swizzle? Yes. It was love at first bite. Since then, they have supported our mission. 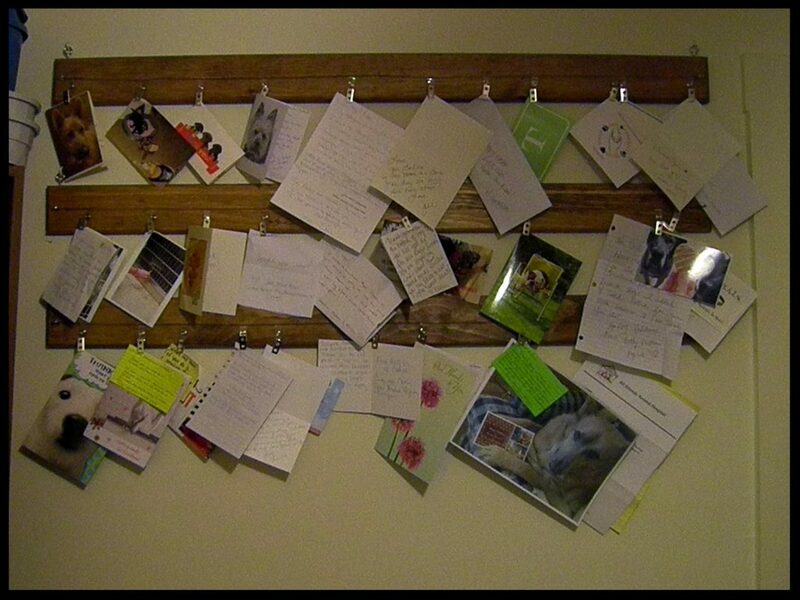 Later that year, in 2014, Bruce and Christine sent us these handcrafted decorative wall pieces, as a surprise gift, to hang photos and other stuff. Lisa immediately hung them in our biscuit room. Yes, we have a biscuit room. 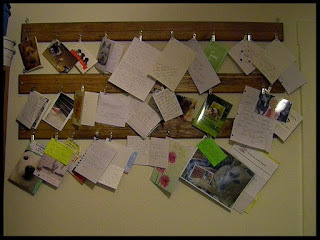 Since then, we've used these pieces to hang photos, thank you cards, letters and notes from our Bodacious Community. In February of 2015, we launched a 'Hearts For Piper' fundraiser. Our friend, who is an ACO, adopted a Great Dane puppy who, sadly, needed surgery to remove both of her eyes. This surgery was costly and we wanted to help. Within a day or so, Bruce and Christine stepped up to the plate and offered custom made, handcrafted kitchen cutting boards and bathroom organizers for sale. All of the proceeds would be donated to our ACO friend to assist with the cost of surgery and recovery. 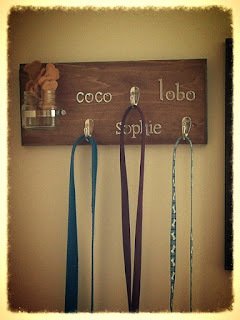 A week later, they added these treat jar leash holders to the mix. We sent them bags of biscuits to include with the orders. 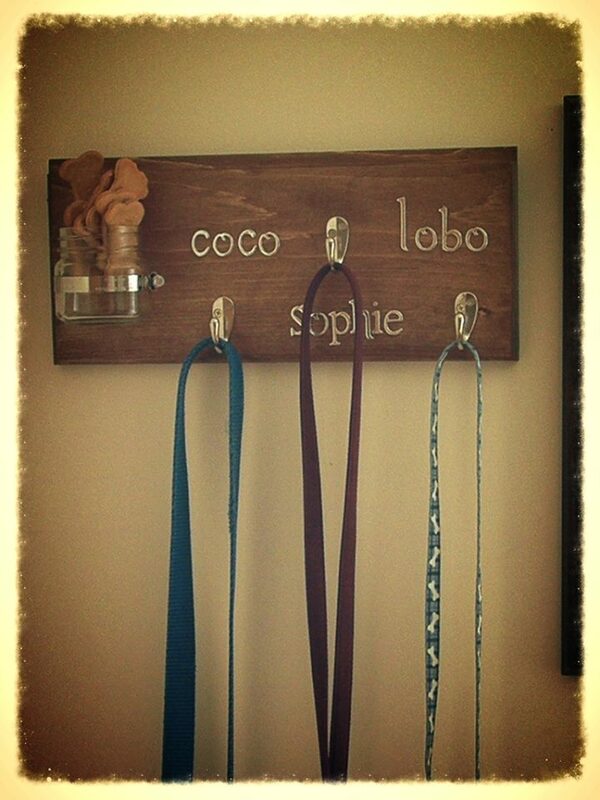 And...we couldn't pass the treat jar leash holders up. We've since ordered 2 other decorative pieces from Daily Wood and Christine. Lisa and I were in awe. Shocked. Speechless. Bruce (aka Daily Wood) is an exceptionally talented woodworker. Both him and Christine work 'round the clock. The dynamic duo. For them to take the time, fork out money for supplies and donate all proceeds to Piper's surgery and recovery. Saying "thank you" just doesn't seem like enough. 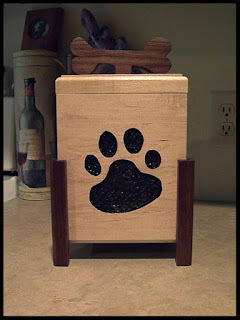 A couple of months ago, Bruce posted photos of a treat canister made by a woodworking friend of his, Frank. When I saw the photos, I was impressed. I've come across hundreds of treat jars in my day, but this one...wow. I replied to Bruce's post and expressed how awesome the treat jar canisters were. A week or so later, Bruce posted that he had received the large handcrafted treat canister he ordered...along with another for a gift. I thought nothing of it. In fact, I scribbled a note to reach out to Frank to inquire about these treat canisters after the holiday season. On December 29th, I stepped outside for a bit of fresh air. There was a package on the porch. I didn't need to look at the return address. The tape job alone gave it away. Christine has won my personal award for Best Tape Job of all time. After spending about 5 minutes getting through the tape and packaging, there it was. THE treat canister. A gift from Bruce, Christine, Maximus and Titan. We love our handcrafted treat canister SO much, it's now our table centerpiece. 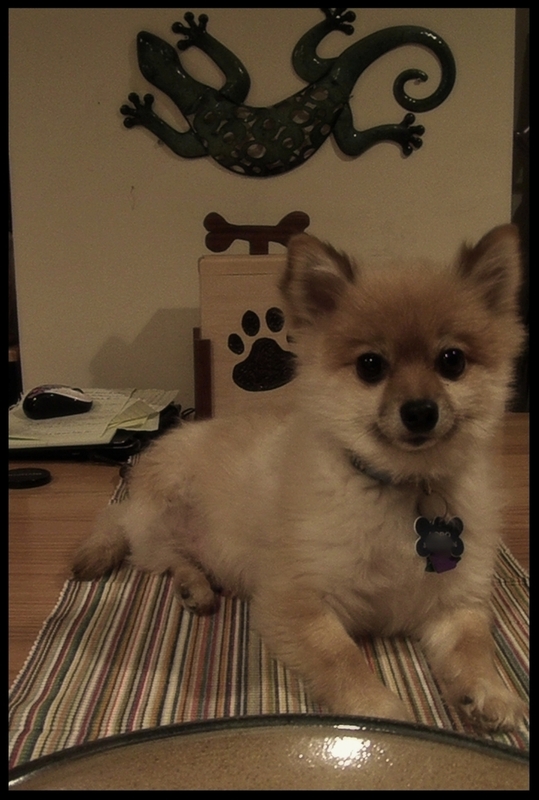 While attempting to photograph our new centerpiece, Lisa put Lobo on the table. Epic photobomb. Lisa and I support local artisans and we are nothing short of impressed with the work of Daily Wood, Christine and Frank Snyder. Your work is impressive. All of it. It's obvious you put your heart and soul into everything you do...and that's apparent with the attention to detail and fine craftsmanship. Treat Jar Leash Holders contact Daily Wood or Christine.